Gladiator Garageworks is a flexible, scalable and easy to install storage system that suits all garages and needs, small or large. In August 2001 Whirlpool held an innovation day. Marketers, Engineers, clever ideas people in suits and lab coats all assembled in a room to ‘think’. They were mixed together, broken into smaller teams and then each allocated a room of the house. The team allocated to the garage developed Gladiator Garageworks and it was launched in the USA in 2002. Until that team of Whirlpool designers decided to think outside the square, the garage had always just been … well a garage … a place to park your car and pile up clutter that wouldn’t fit anywhere else. But Gladiator Garageworks can really transform your garage into something else. You’ll want to hang out there. It’s time to rethink the garage. Gladiator Garageworks is the complete storage solution for your garage. Constructed from heavy duty steel and materials, these high quality cabinets, wall systems with tracking, baskets and hooks will keep your garage organised in style. Imagine a garage that predicts your changing needs and easily adapts to accommodate them, a garage organisation system so advanced that clutter becomes a thing of the past. Imagine a garage that looks as amazing as it works and is the focal point of your home, not just an after thought. Whether your garage is full of tools, sporting equipment or gardening gear, Gladiator Garageworks has the solution for your garage. When you liberate your home from ‘stuff’, remove clutter your cupboards and living areas, and get things up off your garage floor so you can actually see your car, you will love living in your home again. Remove clutter from your life and you’ll also de-clutter your mind. The next time you decide you need something and would really like to put your hands on it … like NOW … well … with Gladiator Garageworks you can! 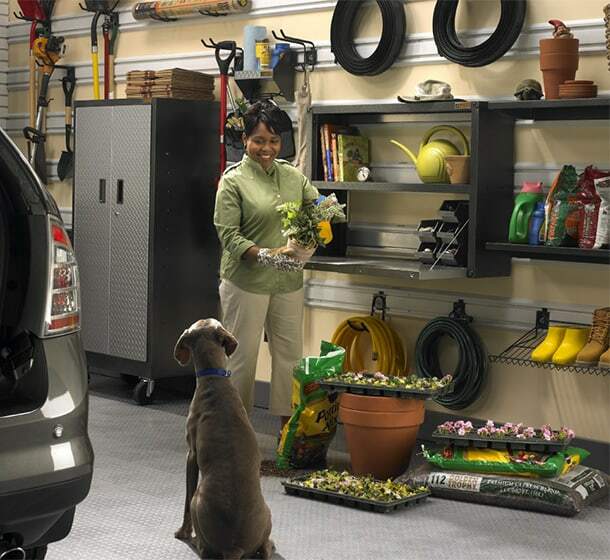 Reclaim space in your home, your living areas, your rumpus room, your deck, and in your garage. Gladiator Garageworks can help liberate those cluttered areas in your home that never seem to stay tidy … by utilising the space in your garage. No more constant weekend clean-athons only to have it spilling out on the floor again by Tuesday. No more rummaging through cupboards and boxes looking for things. All Gladiator Garageworks products are modular and our slot wall system allows you to easily re-arrange or add cabinets and components as your needs change. Your Gladiator Garageworks system can grow as you and your family grows. Gladiator Garageworks is the only product designed specifically for the garage. Our range of wall hung cabinets, shelving systems, baskets and hooks is a complete system that offers a choice of full or partial wall coverage to suit literally any garage. You’ll only purchase Gladiators Garageworks once. And that makes us happy! Gladiator Garageworks is built to last. Constructed from heavy duty materials and backed by the Whirlpool name and warranties. We employ a team of geeks in white coats to put your Gladiators Garageworks system through the ringer. Wall systems are also tested with half the number of recommended screws. But all you really need to know is this … you could hang an elephant off this stuff and it ain’t gonna move. Superman was the Man of Steel, and Gladiators Garageworks is the storage solution of steel. There’s none stronger. They also feature our signature sleek Tread Plate design and a durable powder coat finish with oversized casters and piano hinges. Coordinated to create a uniform look in your garage, the distinctive look of Gladiator Garageworks is rugged, stylish and easy to clean. You garage will really turn heads. Gladiator Garageworks Storage Solutions really is quick and easy to install. 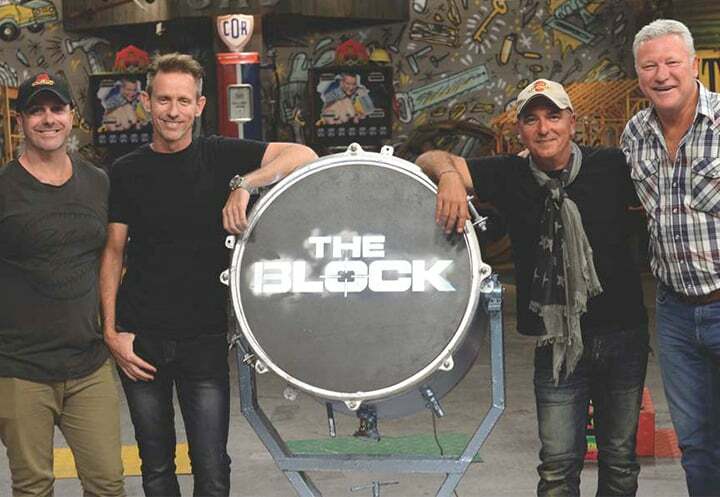 Julian Cress – Executive Producer – “The Block 2010”. With this new series of The Block we have garages for the very first time. These were the only thing we renovated before the contestants arrived. We wanted to create an oasis for them from the dust and dirt, somewhere to stay organised and store their tools and hardware. We found the perfect solution for this in the Gladiator range of garage storage solutions. These proved so handy for our four couples that most of them brought the products into their homes during their renovations so they could keep some sense of order amidst the chaos. Gladiator quite literally came to their rescue.